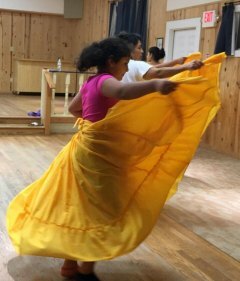 It’s 8:00 o’clock on a chilly fall evening but the lights are on at the Ocracoke Community Center as the eight members of the Ballet Folklórico de Ocracoke (Folk Ballet) gather to rehearse. 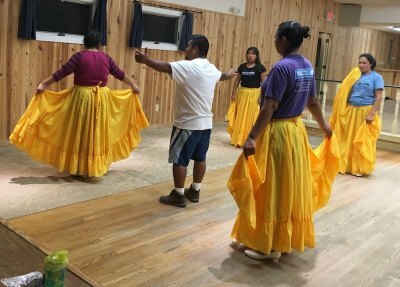 Under the leadership of David Perez, the group has been meeting multiple nights a week since August to learn and practice traditional Mexican dances in preparation for the upcoming Festival Latino, Nov. 9-11. The dancers prepare to practice in yellow skirts used as part of the costumes for the dances from the state of Guerrero at the Ocracolk Festival. David Perez instructs the dancers, left to right: Antonia Ortiz, Gisselle Perez, Rocio Trejo, and Sara Rodriguez. David has been involved in traditional dance for many years. Beginning in high school, he danced with a troupe from his native town of San Felipe Teotlalcingo in the state of Puebla. He became a part of the group at the encouragement of one of his high school teachers. David and a couple of friends tried it and discovered that not only did they enjoy the dance but they were good at it. The dance troupe traveled to competitions with other high schools and performed throughout their region. They even made some instructional videos! 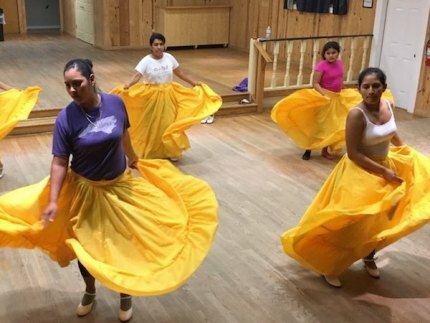 The dedicated members of the Ballet Folklórico de Ocracoke are local residents Antonia Ortiz, Yaneth (Janeth) Camacho, Rocio Trejo, Dellanira Romero, Sara Rodriguez, Fide Villanueva, Gisselle Perez, and the youngest member of the troupe, 10 year old Amy Ortiz. 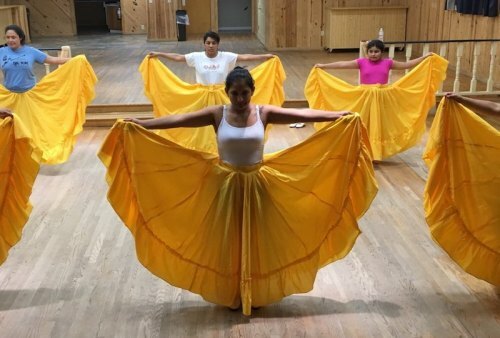 Rocio, Dellanira, Antonia, and Yaneth have been dancing in the group since last year; they performed at the 2017 Festival Latino, but 8th grader Giselle, daughter of David Perez and Yaneth Camacho, is dancing for her first year. “My parents made me,” she said with a smile. Fifth grader Amy Ortiz, the youngest dancer. This is the second year of dancing for fifth grader Amy Ortiz. She said that she enjoys learning the different dance movements. This is also the second year for Coahuila native Sara Rodriguez. When asked what she enjoyed most about her involvement with the ballet group she agreed with the other members that is is fun. 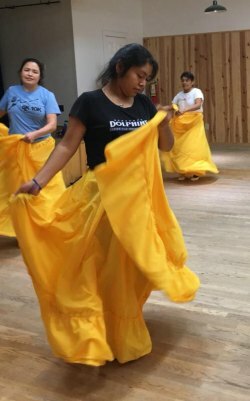 Although Fide Villanueva, originally from the state of Hidalgo, Mexico, is only in her first year with the group, she also danced at the Ocrafolk Festival. “David is a very good teacher,” she said. Just as the dances are specific to states and regions of Mexico, so are the costumes. David Perez said that acquiring the costumes is a challenge since they are made in Mexico and then someone must bring them to the United States. “You can’t just go online and order them,” he said. This year’s costumes will be kept a secret until the performance at the festival. 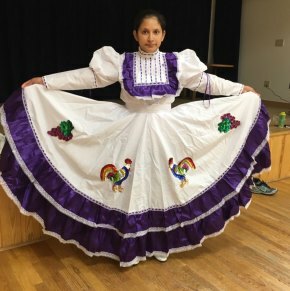 Dellanira Romero was kind enough to model a costume from last year’s Aguascalientes dance. The dress has a circle skirt containing yards of fabric and is accented with lace and ruffles and elaborately decorated grapes and fighting roosters, which are part of the Aguascalientes tradition. Dellanira Romero models a dress from the Aguascalientes dance featuring the traditional emblems of grapes and fighting roosters. Mexican folk dance is happy and very energetic. On this evening, though the weather was chilly, the dancers quickly shed sweaters and reached for their water bottles during breaks between songs, but soon the music began again, they took their places, and practice resumed, with feet flying and skirts whirling. 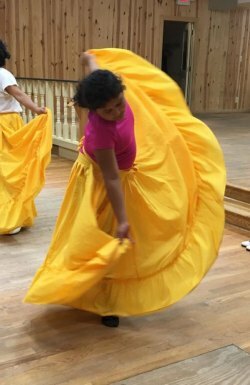 The Ballet Folklórico de Ocracoke performance will be on Saturday, Nov. 10 at the Festival Latino de Ocracoke, sponsored by Ocracoke Alive. For schedule and information, click here.